Frames Data, a subsidiary of Jobson Healthcare Information (JHI), is a publisher of magazines, journals, collateral material and catalogs in the optics industry. In addition, they are a market leader for frames and lens data information, providing frames and lens information from optic, eyeglass, and sunglass manufacturers for franchises such as Lens Crafters and Pearle Vision. Jobson's goal was to simplify the process of inputting, producing, accessing and distributing their frames and optical data information. The new process had to be compatible with a Microsoft platform, while providing consistent, secure and reliable access to the frames data. Content would be used in both their own publications as well as those produced by their clients in the optic industry, from print to web based. Such a system would enhance satisfaction for current clients and attract new clients in the optic industry. Prior to DPCI's engagement, Jobson routinely hired consultants and outside firms (all with limited publishing experience) to assist in the development of their software applications. In addition, Jobson had an internal team building a content management system for their optic frames data. Individually and collectively, these efforts were not fully successful. DPCI was retained to build a content management system that would allow easy re-use of the optic information in multiple formats without staff having to manually extract and format the data for internal and external use. DPCI helped Jobson design and implement a content management system that leverages the power of Microsoft's enterprise technologies to deliver content to print and Web formats. The recommended solution was a multi-tier application using Win2003 server, SQL Server 2003, the .NET Framework, DeKlarit and XML. Using DeKlarit for C#.NET and ASP.NET an object-oriented optic data structure was created. DeKlarit was used as the data manager in between the business logic layer and SQL Server 2003. 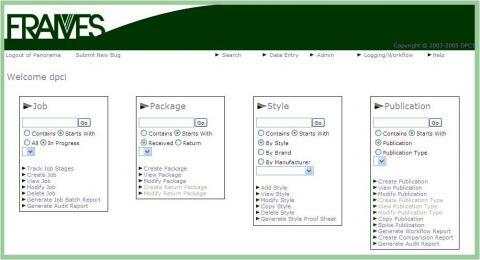 The construction of a web-based user-interface using C#.NET and ASP.NET enabled users to manage optic product information and images. This content is gathered into a variety of different publications (from print to web) and then output from the system as XML. The XML is then transformed into a format applicable to the target media. Formats include other XML files (based on XSLT transformation), CSV, or QuarkXPress Tags (which is a proprietary format for publishing in QuarkXPress). DPCI further integrated WAVE MediaBank digital asset management system with this content management system so that Jobson's end users and customers could easily retrieve graphics to associate with optic frames data. With a reorganization of underlying data, the production of such varying output formats is a simple transformation from XML using XSL. This allows Jobson to present a unified UI for internal staff regardless of the target media. By upgrading its system, Jobson has been able to produce published products with lower cycle times and fewer errors. In addition, the system DPCI developed and designed was modularized, allowing for the future enhancement of the applications features and infrastructure, and thus providing Jobson with the ability to add more product offerings for its clients (a true value added) using the service, and thereby creating added revenue sources. Finally, the new system helps Jobson's clients - in the next iteration - easily access and work with the optic data, create their own custom output and products, and reduce the dependency on Jobson's internal resources to assist in creating these products.